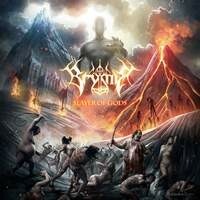 It seems Brymir seems to go dormant for a bit, blast up from out of nowhere and deliver an epic piece of melodic death metal and disappear once more. It took 5 years to follow up 2011’s debut Breathe Fire to the Sun, and now it’s been 3 years since Slayer of the Gods surfaced. But, you can’t keep a good band down, and Brymir once again take to the skies with Wings of Fire. Even if it does feel a bit formulaic this time around. The bottom line is that Brymir have locked in their sound. They bring the epic and grandiose feel to melodic death metal (particularly in a Norse variety), and if you are down with it, they deliver the goods. Wings of Fire seems true to the band’s sound, focusing in on the bombastic symphonic/power metal components as well as more fiery melodeath ones, really pushing the contrast as far as they can take it. Riddling some tracks with blast beats, then swinging into more symphonic or atmospheric moments with some flashy guitar melodies, and a big chorus to top it all off (see “Ride On, Spirit”). The tracks are quite condensed for what they attempt to pull off in each one – most hitting a 3-4 minute sweet spot, a nice diversion from those who usually go the ‘epic’ route and bring things into 8-10 minute territory to accomplish the same means to an end. If there’s one fault to all of this though, it’s that as good as each track sounds on its own, there’s a bit of homogeny to the whole thing as you continue to listen to it. It’s only halted at the end with the atmospheric closer “Anew” (with guest vocals from Noora Louhimo of Battle Beast). 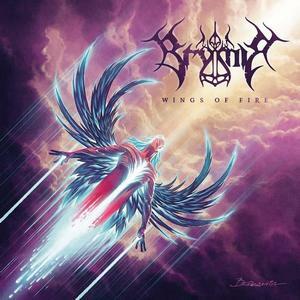 Those who have enjoyed Brymir’s take on symphonic melodic death metal will be happy to sink their teeth into Wings of Fire. It continues the band’s efforts with noble passion, though a few more switch ups in the formula along the way might allow the band to really push it to the next level.